‘England has changed.’ This is the starting sentence of A Distant Shore, in the voice of Dorothy, a music teacher in her fifties attempting to settle down into early retirement. She has a lonely existence, which is flecked by the occasional visit to the pub or trips to the doctor ‘specialist’. Through these visits, she meets Solomon, the second protagonist of the novel. He is a lonely, coloured man in his thirties, whose handyman and watchman job in the village allows him plenty of time to polish his car, which he does seemingly endlessly. Their relationship is, tragically, brief. It is constrained by society’s codes, and both of the characters are uncomfortable in each other’s presence (as well as others’). It turns out to be the only real human contact either of them will experience, which makes the short time over which it develops even more tragic. Before it matures, Solomon is brutally attacked and killed by local thugs, and Dorothy slips slowly into extreme loneliness and madness. 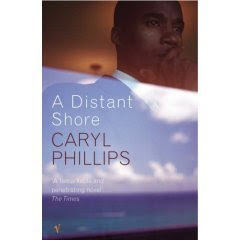 In order to deal with the complexity of the changes Caryl Phillips hints at in his first sentence, he splits his narrative into two voices: Solomon’s and Dorothy’s. Their lives at first seem completely different, but as the focal point of the novel, they reveal painful intricacies which are similar for both protagonists. A normal woman, Dorothy left her working class roots to go to university and then became a teacher. Her husband walked out on her, and from then her life is characterised by affairs, early retirement and mental instability. This psychology is portrayed well by Phillips: the use of the narrative voice, which goes from her own perspective to the third-person, shows the differentiation and hence the delusion of the protagonist with which we empathise. For example, Dorothy sees her interactions with Mr Waverly, a fellow teacher, as simple human communication. It is only later, when we learn that sexual harassment charges are brought against her, that we learn that she is obsessed and perhaps not a totally reliable narrator. Solomon, the owner of the other narrative voice, offers another isolated and sorrowful story. As a child in Africa, his past is ravaged by war, crime and the brutal murder of his family. On his way to the promising ‘lights’ of England, he kills a friend. His journey is affectingly desperate, and when he illegally reaches England he is greeted by being robbed, falsely put in prison and forced to flee to North England. Once he is a ‘legal’, he eventually comes across a car, house and job, next-door to the woman with which his story is intertwined. I feel the need to draw attention to Phillips’ skill in constructing the novel. The storyline will, without a moment’s notice, grind to a halt and suddenly jump into the past. The reader is startled into adapting, and the technique proves to be extremely effective. It allows us to piece the story together little by little, as well as giving us an insight into the future. Some of this can be chilling: when Solomon describes the racist abuse he receives (‘somebody introduced dog mess through my letterbox’), the effect is even greater as we know the tragic conclusion of these thugs’ actions. It is a bleak novel, offering a negative depiction of English society: ‘The light in England is very weak.’ It is also an illuminating novel: like Trainspotting, it provides an insight into a ‘marooned’ (to use Phillips’ words), isolated cohort of society that very rarely gets a voice. Despite their intensely contrasting backgrounds, Dorothy and Solomon are alike in their failure in human interaction. The sadness of the novel, and of England as a whole, is in the heart-rending fact that the protagonists' relationship was doomed from the very beginning.